When JP Auclair’s urban segment from Sherpas Cinemas’ 2011 film “All.I.Can” hit cyberspace, it garnered 124,000 views its first day live. 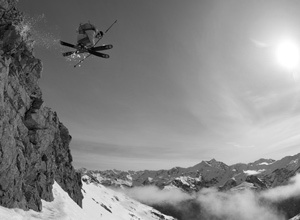 JP was a pioneer of freeskiing and a true hero of the sport. He was one of the first to popularize grabbing, he won the first US Open, and he helped create the Salomon Teneighty. Auclair founded Armada skis in 2002 and Alpine Initiatives in 2008. In October 2014 we lost JP to an avalanche in Patagonia. He was a father, a fiancé, a son, a brother, a godfather, a friend, and genuinely magnificent human. He will forever be with us in spirit.